Grandpa really likes Chicken Noodle Soup. 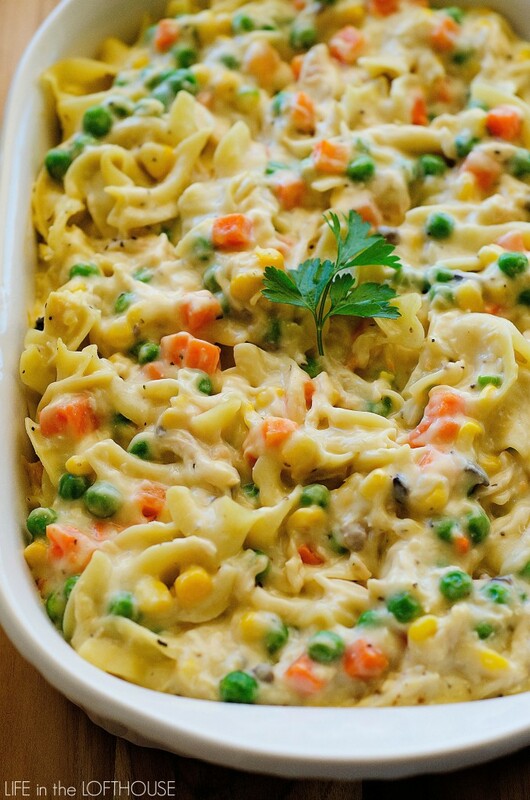 When I came across this recipe for Chicken Noodle Casserole, I knew I had to save it and make it for him. I found it at life-in-the-lofthouse.com. Preheat oven to 350° F. Spray a 9×13 inch baking dish with nonstick spray. Boil egg noodles according to package directions. Drain water. Meanwhile, in a large bowl combine all the other remaining ingredients. Add cooked noodles to mixture. Gently stir to combine everything. Pour into prepared baking dish. Cover with foil. Bake 30 minutes or until heated through. Remove from oven and let stand 5 minutes before serving. Enjoy! I found this wonderful recipe at melskitchencafe.com. Heat oven to 350. In a shallow dish combine the flower and seasonings. Dip each piece of chicken in flour mixture and coat evenly. Melt 2 TB butter in a shallow baking dish, large enough to accommodate chicken in a single layer. Arrange chicken in pan and bake uncovered for 30 minutes at 350 degrees. Meanwhile, in a small saucepan, melt remaining butter and add honey, lemon juice, soy sauce and ginger. After chicken has baked the 30 minutes, turn each piece over and pour sauce mixture evenly over chicken. Bake another 30 to 40 minutes basting frequently. Serve over rice. I usually double the sauce ingredients to make more to serve over the rice. 1. Mix the honey, soy sauce, Worcestershire sauce, garlic and salt together. Marinate your chicken breasts for at least 8 hours. 2. Grill (OR for oven method: preheat oven to 350 degrees. Pour small amount of sauce on bottom of the pan and place chicken on top. Cover with foil and cook for about 30 minutes or until center is no longer pink and juices run clear. 3. While chicken is cooking, fry up the bacon and set aside. 4. When the chicken is done, top each breast with 2 tablespoons of BBQ sauce, two strips of bacon and 1/4 cup of shredded cheese. Broil until cheese melts. In a large Ziploc bag, combine chicken breasts and about 3/4 of the bottle of Caribbean Jerk Sauce. In a separate Ziploc bag, add the bacon and remaining Jerk Sauce. Put in fridge overnight (or at least 6-8 hours). Take out the chicken, discard marinade and grill turning only once if possible. Add bacon to the grill. When the bacon seems cooked through (watch it closely, don’t overcook). Place the chicken on top of 4 bacon pieces and lay the remaining bacon over the top of the chicken. Grill on low for another few minutes. Serve with grilled pineapple. Place the chicken breasts in a glass baking dish. Stir the onion soup mix, cranberry sauce, and French dressing together in a bowl until well blended. Pour over the chicken breasts. Cover the baking dish with plastic wrap and refrigerate overnight or 8 hours. Remove the plastic wrap from the baking dish, and cover the baking dish with aluminum foil. Bake chicken in preheated oven until top is bubbly and slightly browned, about 1 hour and 15 minutes. You can freeze it for later. Put all the ingredients in a gallon freezer Ziploc bag. Close it and then mash all the ingredients with your hand to mix it. Thaw in fridge and then dump the contents into your crock pot and cook 3 hours on high or 6 hours on low. I got this recipe as a newlywed. This recipe is kind of rich with the bacon and sausage and whipping cream, so I don’t think of it as a regular week night kind of dinner, but it’s something you would make for a special occasion . . . like for Valentines’ Day . . . .when you wish you were at Romano’s Macaroni Grill but you aren’t. It’s very, very good. Slice bacon strips into 1/2-inch pieces. Saute in a large skillet until crisp. Set aside on a plate. Squeeze Italian sausage from casing into hot bacon fat and break into small chunks. Saute about 10 minutes over medium-low heat until cooked through. Add garlic and saute briefly. Return bacon to skillet. While preparing bacon and sausage, combine water, salt and oil in a large saucepan. Bring to a full boil. Gradually add spaghetti, maintaining a boil, easing it into the water as it softens. Cook uncovered about 12 minutes until tender. Cooked spaghetti should cut cleanly with a spoon. Drain spaghetti in a strainer or colander. Return to saucepan over low heat or put in a warm chafing dish or electric skillet to finish at table. Toss hot bacon and sausage, including drippings, into spaghetti. Push spaghetti to sides of pan and break egg into center. Quickly scramble egg and stir it into spaghetti. Toss in grated cheese. pour in 1/4 cup whipping cream or half-and-half. Mix. As cream is absorbed, add up to 1/4 cup more. Add black pepper and nutmeg. Garnish with minced parsley. Makes 2 servings. I love this recipe of Grandma’s. It is such a yummy comfort food. It only takes 20 minutes to prepare and 35 minutes to bake. Serves 12. Prepare vermicelli according to package directions; drain. Return to pot, and toss with chicken broth. Stir together chopped cooked chicken and next 8 ingredients in a large bowl; add vermicelli, and toss well. Spoon mixture into 2 lightly greased 11×7-inch baking dishes. Sprinkle evenly with Cheddar cheese. Bake, covered, at 350 degrees F for 30 minutes; uncover and bake 5 more minutes or until cheese is melted and bubbly. 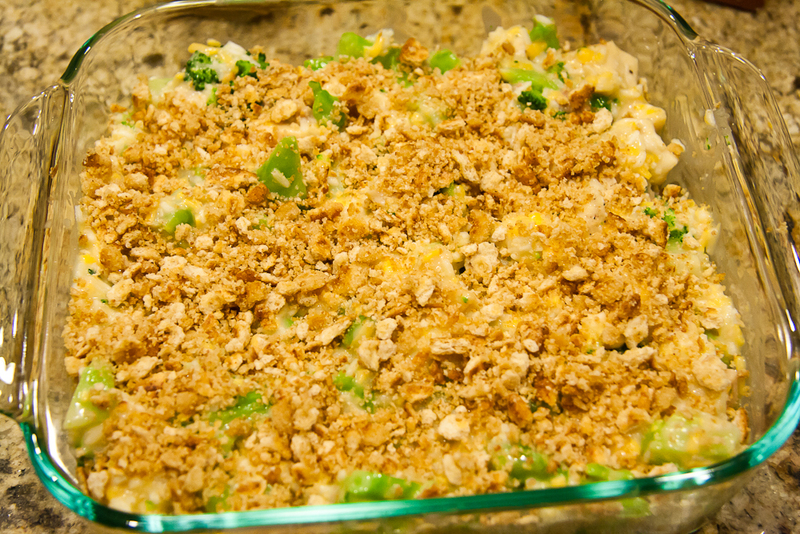 Note: Freeze unbaked casserole up to 1 month, if desired. Thaw casserole overnight in refrigerator. Let stand 30 minutes at room temperature, and bake as directed. Place 3 thawed chicken breasts on the bottom of your greased crock pot. Sprinkle a teaspoon of chicken bouillon over chicken. Add mixture to the top of the chicken and cook on high for 3 hours or until chicken is cooked. 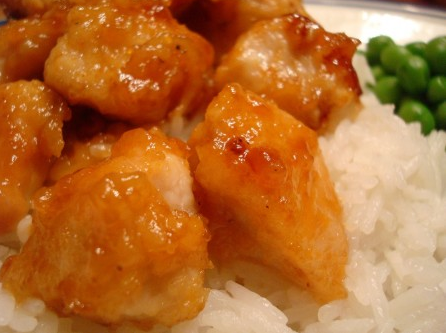 Shred chicken and then add 1 cup instant rice to the crock pot. Cover and cook for another 10-15 minutes or until rice is done. Serve in enchilada shells. Mix chicken with all ingredients except 2 T of butter and croutons. Mix the butter with croutons using only enough so that it is not soggy and sprinkle over the top of the casserole. Bake at 350 degrees F for about 45 minutes or until bubbly hot. Serve over hot rice. 1. Heat olive oil in a large pot on medium heat. 3. Add garlic and ginger, sauté for 2 minutes until fragrant. 4. Add 2 cups of water and the rice and stir. 5. Cover the pot and bring water to a boil. 6. Uncover, stir, then reduce heat to low. Cover and simmer for 15-20 minutes, stirring occasionally to prevent sticking. 7. Add soy sauce, rice vinegar, honey, and Sriracha. Stir to combine. 8. Combine 1/4 cup of water with the cornstarch to create a cornstarch slurry. Add the cornstarch slurry to the pot and stir, cooking until the sauce thickens (3-4 minutes). 9. Garnish with scallions (optional) and serve immediately.